Bluesdoodles is delighted to have once again the opportunity to have a conversation with the invited participants for the Fifth UKBlues Challenge. 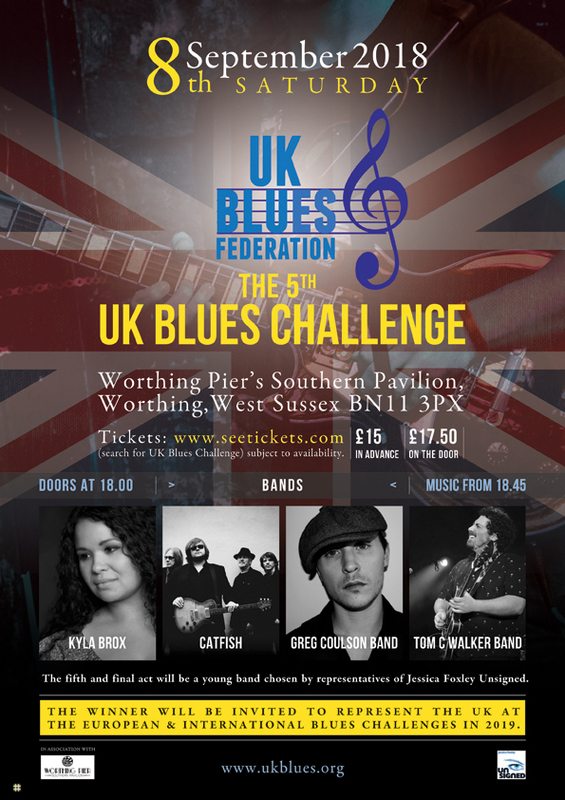 The judges are going to have a real challenge in deciding the which of the five bands (Kyla Brox, Tom C Walker, Catfish, Greg Coulson, and band number five to be announced after Great British Rhythm and Blues Festival, Jessica Foxley stage will be choosing the fifth band!) are going to be heading off to represent the UK at the 35th International Blues Challenge in Memphis in January 2019 & 9th European Blues Challenge in Ponta Delgada in the Azores in April 2019. Third conversation with Liz over at Bluesdoodles is with Kyla Brox, The band is always superb Kyla’s stunning soulful vocals are joined by guitarist and life partner Danny Blomeley. Kyla brings authentic blues every time she steps on stage. KB: No, thank you, it has been such a busy summer for us. BD: So what has been keeping you so busy on the run-up to the challenge? KB: including a tour in the Czech Republic with a Czech band it was great all good fun. Then playing in Italy at a really nice festival on the border with Slovenia. Now going away again with gigs in France. So keeping busy while trying to finish a new album the end product is really exciting. Should be released November 2018 in time for Christmas Presents! Before that, I had so much fun with Ladies of the Blues absolutely brilliant. I have known Connie for a while and now had the opportunity to play with her. I had not met Erja before so happy to have shared a tour with her. Erja has so much positive energy, so conscientious about her performance a true professional. It was a great set up 9 Nights, we all got three times to play first, second and third. Steven at Solid Entertainments put together a winning combination. KB: Amazing and great and also a bit nerve-wracking. I would be so thrilled to represent the UK, but we will have to wait and see. Obviously, I have judged the event and know what a difficult decision it is when faced with such talented musicians. As an Ambassador for the Federation, I have also enjoyed the challenge as part of the audience so it is very exciting now to be experiencing the challenge as a participant. The band is looking forward as they have not been to a challenge it is definitely going to be an interesting experience. At the end of the day, someone has caught the judges attention and gets to represent the UK. We will be following in the footsteps of great bands and Kaz’s tremendous achievement of winning the Europeans and doing so well in Memphis. The challenge for me is a celebration of British Blues The bands are all different, at the moment I am the only woman performer. Unless the band representing Jessica Foxley is a woman, then we would have some girl power! Have always been women in blues and music general was quite a discussion with lots of issues, sadly it is still the same. I was at a festival in Sweden which was 50/50 Women and Men. This was throughout the festival, staff, volunteers, sound crew and the bands. It created a brilliant feeling, made you realise how imbalanced other festival events are. There is still so much arrogance around I love men spend most of my time with men as a woman it is not unreasonable to have the same reason as men to expect themselves to be expert, and talented in their own areas of knowledge. BD: What are the Blues to Kyla? Do you feel British Blues has a different feel to what is being currently produced in Europe, the United States and elsewhere in the world? KB: For me, it is the perfect form of expression, so pleased to have grown up surrounded by the blues. Blues singing gets out all of my emotions can be quite cathartic. It is an art form in every way. From the stage there is a real connection with the audience. Blues is perfect, I learnt from my Dad when he performs he always puts deep love into the music connecting with the Blues. British Blues is different now is more blues/rock and has a different edge. I definitely do not fit in with the Blues Rock sound. There is more soul in blues working in Europe. UK is definitely missing out on some great European acts, we are seeing less and less European bands which is a real shame. Wish we could get a flavour over here, there is definitely less money around. In Europe there is lots more funding from Government and Arts Councils, so there are bigger budgets to put on bands and less financial risk. That said I am definitely proud of UK Blues. BD: Kyla, your last album was Throw Away Your Blues out in 2016 any plans to be back in the studio soon once the festival season across Europe is over? KB: We do have a new album, it is already recorded in studio I love based just outside Leeds, Chairworks. The cover is going to be amazing and the music inside full of blues with great Backing Vocals, Harp and full horn section from Haggis Horns plus Tony Marshall’s Trumpet. Now we are concentrating on mastering and getting the mix right adding Backing Vocals, this album definitely has been a bit more labour intensive but will be worth it. Planning to release in November in time for Christmas. KB: Blues Federation does a really good job. The Challenge is such an opportunity and the addition of Awards this year is a real step up. I so regretted not being able to be there but out on tour. The challenge especially is helping to raise the profile of current British Blues in other countries. For the European Blues Union gives us credibility now we have a Federation. Having that support nationally I think is great and makes a big difference. Without the Federation, bands would not have the opportunity of playing the USA or European challenges. The IBC/EBU would not accept us to play without the nomination through a national federation/union. When I was younger I even considered contacting Australian Union as I was playing out in Australia a lot. So the Federation is opening doors through the challenge that is a fantastic start. KB: Kyla started to think got to Etta James on Vocals then laughing there is footage of Etta James the most fantastic female vocalist, with Chaka Khan who inspired me when I was young and the charismatic Gladys Knight joining BB King’s awe-inspiring guitar and full backing band. It is amazing footage that is my dream band.